AirParrot Remote is a brand new app that allows you to remotely control AirParrot 2 with your iPhone or iPad. AirParrot Remote lets you easily control what’s being mirrored or streamed from your computer to Apple TV, Chromecast and Reflector-enabled devices from the palm of your hand. Use it to begin mirroring or streaming to Apple TV and Chromecast, create media playlists, control your computer and more from anywhere in the room. AT WORK. ON THE COUCH. IN THE OFFICE. AT A PARTY. We’ve all been there. Too lazy to get up for the remote. Who actually needs to watch seven episodes of Top Gear in a row? Change the media you’re streaming from your phone. We know you’re not forgetting that thing anywhere. AirParrot Remote is a convenient way to browse through and begin streaming files stored on a media server. There’s no need to get out of bed to watch that next episode or start a new movie. You no longer need to bring your computer to the conference room. Pull out your phone, open AirParrot Remote and command your computer to connect to the conference room’s display. Check the live preview of your laptop screen and then begin mirroring! Use the built-in remote control options to pull up your presentation, and then flip through slides with a quick tap of the screen. Create a playlist of your favorite party jams, and control it from your phone. AirParrot Remote allows you to line up an endless supply of music found on your computer. Add your tunes, and rock on! Your iPad isn’t just for games. Set it up beside your computer monitor and use AirParrot Remote as a second screen! How, you ask? Once AirParrot Remote is paired to AirParrot, tap the Extend Desktop button on your iPad and then tap the desktop preview. Viola! Extended desktop on your iPad! Select media from your computer and stream it continuously! Control your keyboard and mouse without being near your computer. View your computer desktop on your phone or tablet before you begin mirroring. Connect AirParrot Remote to any computer on your network running AirParrot 2. 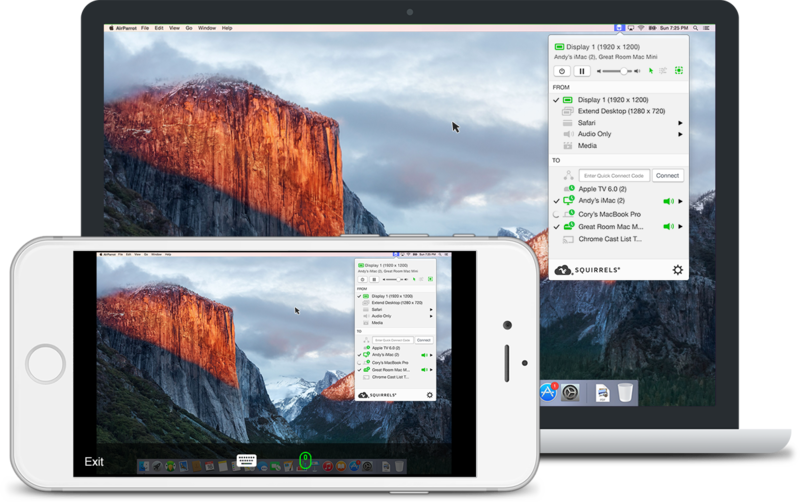 The AirParrot Remote interface closely mirrors its desktop counterpart. AirParrot Remote allows you to easily build playlists containing files found on your computer. 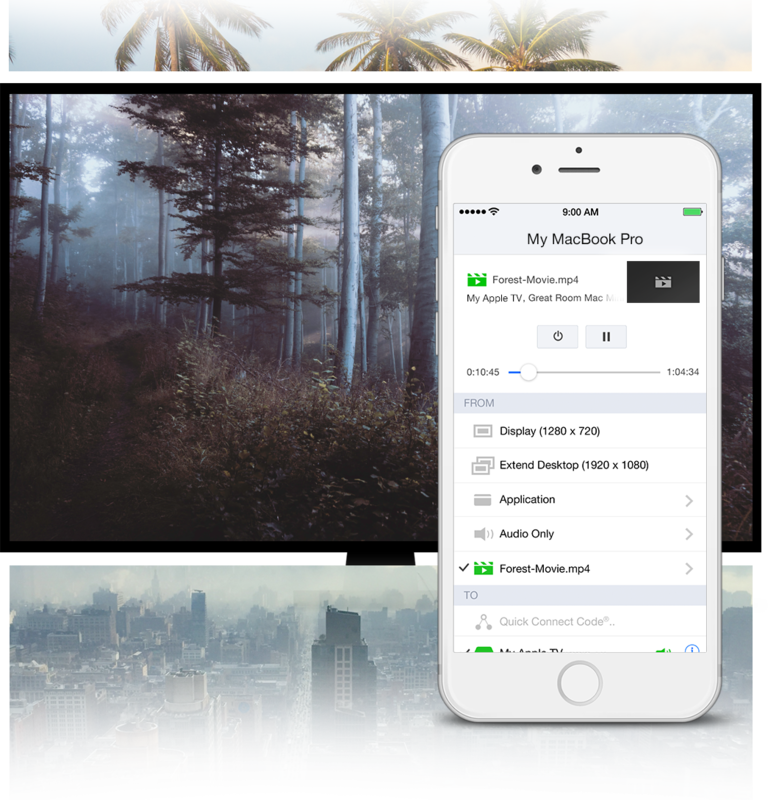 Arrange your media without touching your keyboard and mouse, and stream it to any available destination such as Apple TV, Chromecast or Reflector-enabled devices. Creating a playlist with your iPhone or iPad is easy and fast. You can queue files for continuous playback so you never have to skip a beat. In addition to controlling AirParrot 2, AirParrot Remote also allows you to control the keyboard and mouse of your computer. 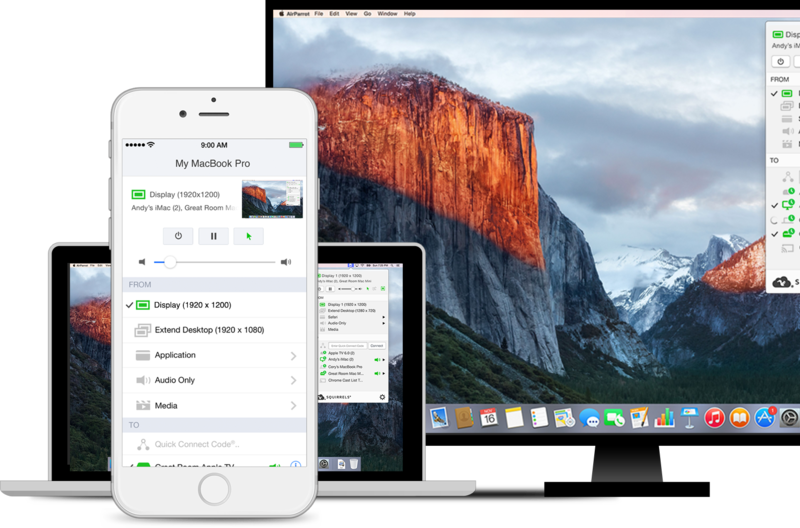 Preview your desktop before you begin mirroring, and if necessary, use your iPhone or iPad as an input device to quickly prepare your screen for mirroring.